Haley Gustafson | Daily Press Delta Animal Shelter volunteer, Gwen Guenette, spends time with some of the 44 dogs, that were surrendered to the shelter in Escanaba last month. 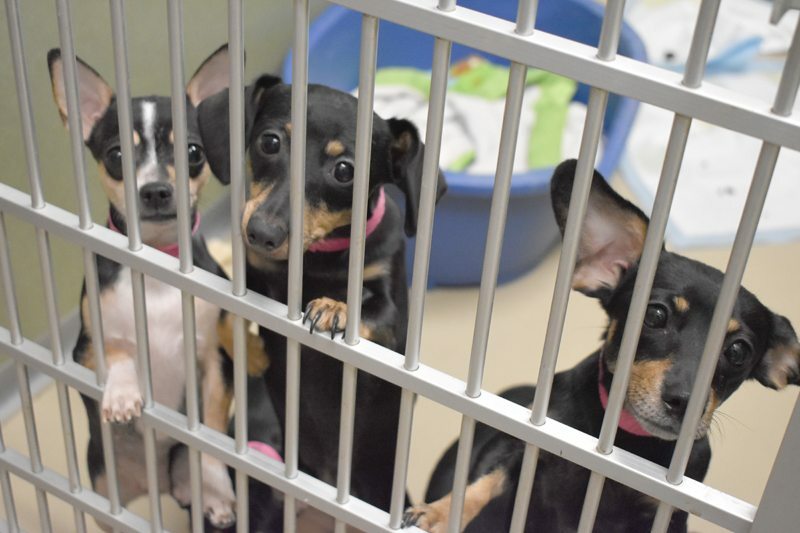 Haley Gustafson | Daily Press Three of the 44 dogs that were surrendered to the Delta Animal Shelter in Escanaba last month peek through their cage at the shelter Thursday. 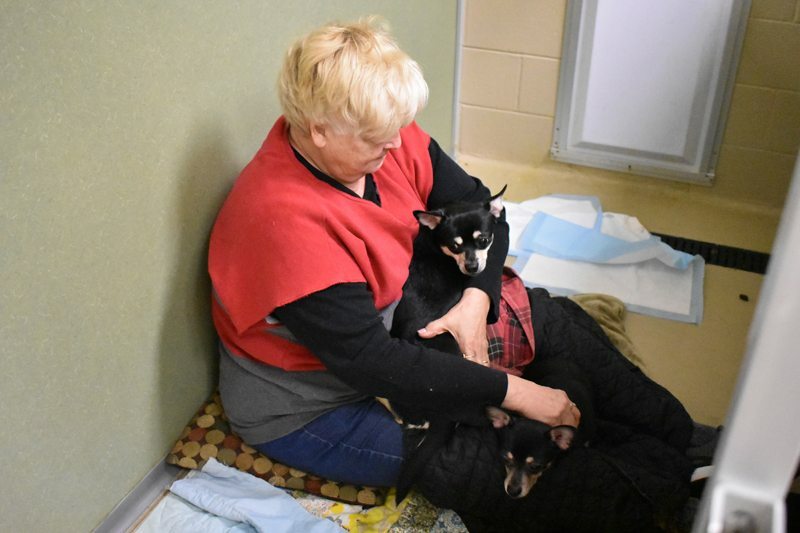 ESCANABA — Forty-four dogs that were surrendered to the Delta Animal Shelter in Escanaba in March are making progress socially and medically, according to shelter personnel. On Thursday, March 22 shelter employees, volunteers, and Gladstone Public Safety began the process of removing the dogs and one rabbit from a home in Gladstone. It took shelter personnel approximately two hours to remove all 44 dogs and rabbit from the home. The rabbit was adopted shortly after arriving at the shelter. The canines are a small mixed-breed known as “chiweenies,” which are crosses between Chihuahuas and dachshunds (sometimes called “wiener dogs”). Prior to coming into the care of the facility, Shelter Manager Sue Gartland said, to their knowledge, the dogs had never been outside and were not house trained. Since arriving at the shelter, the dogs have received rabies vaccinations, heart worm testing, and spaying/neutering. Of the 44 canines, 26 have been spayed/neutered so far, said Gartland. Escanaba Veterinary Clinic and Bay Veterinary Clinic have been on-site for the past couple of weeks offering their medical services to help take on the task of spaying/neutering each dog. “Bay Vet and Esky Vet Clinic have been extraordinary,” said Gartland. One of the biggest tasks with the dogs has been socializing them, explained Gartland, adding most of the chiweenies were not properly socialized in the home. Some of the dogs have scars on their faces from fighting over food, which was sometimes just placed on the floor instead of in a bowl, noted Gartland. Being at the shelter for the past three weeks, Gartland said the dogs have made leaps and bounds socially, not only with the other dogs but with people as well. “The progress has been tenfold,” said Gartland. This is due in part to the countless numbers of community members and shelter volunteers that have visited the facility to sit with the dogs in their kennels, explained Gartland, adding she attributes the dedication of all of the volunteers to the dog’s continuing advancements. Local dog trainers, Mary Gail-Blaiser and Dave Johnson, will hold behavioral classes specific to the dogs to continue to grow socially with people and other animals. The dogs will be put through basic training at the shelter, noted Gartland, including being tested for food aggression, being around children, adults, and other animals. Due to the high medical costs for the 44 dogs, Gartland said the shelter is still accepting monetary donations, not only for the surrendered dogs, but also the other animals housed at the facility. With kitten season right around the corner, the shelter is also accepting donations of Purina blue bag cat food and scoopable litter. As for the chiweenies, Gartland noted she is hopeful that they will be ready for adoption within the next couple of weeks. “They’re cute and very adoptable,” said Gartland. Anyone interested in donating to the Delta Animal Shelter can visit during their regular business hours or by calling 789-0230.